Tragedy struck our house last night. We ran out of candy in the candy basket. I have clearly fallen down on the job. I have not lived up to expectations. I have failed to provide proper sustenance for my poor, deprived children. My children were not placated by my assurances that we would live through an entire night without treats in the house. I think, in fact, that it may have been a crisis of faith moment for my kids… one of those crystal clear times when you realize that your parents are fallible and can, in fact, make impacting, life-altering mistakes. After I got done hugging kids and wiping tears (and — OK, fine — assuring them that we’d buy more candy soon), I was pleased to see that things quieted down relatively quickly. I mean, I wasn’t thrilled that there were histrionics to start, but after the drama we entered a period of calm as the kids drifted out of the room. It took me a while to notice the whispering. And the footsteps up the stairs. And down the stairs. And up the stairs. And down the stairs. And some kind of clinking. But when the second kid came back into the family room clutching candy firmly in hand and sucking noisily on another piece, I caught right on that something was going down. Abby, my eldest, is a saver. For example, she saves money. We keep a bank for her, and I’m pretty sure she has more saved at the moment than we can pay out. She also saves candy. From Christmas. From going to the movies. From friends. From Valentines Day. From gifts. Yep, she’s a saver alright. “Where did you get the candy, Cael?” I asked. “From Abby!” my thrilled little boy answered. “Abby gave you her candy?” I asked, starting to feel all warm and mushy that my 12-year-old was graciously and generously giving her sweets to her sad siblings to make them feel better. “You bought it from her?” I clarified. So that’s the other sound I’d heard. The clinking of change in the piggy banks. And out of the piggy banks. My 12-year-old is running a secret candy ring out of her bedroom. Hmmm. How to spin this. Abby’s an entrepreneur? She’s leveraging her assets? She’s running a small business? She’s utilizing principles of supply and demand? Or she’s a back alley candy dealer, and she’s taking advantage of people in need. Proud? Dismayed? Ambivalent? What’s the appropriate parental response here? I’m going with no harm, no foul. Everyone seems perfectly happy with this arrangement, and it’s saving me a trip to the store. Oh, dear. Now she’ll have an international candy ring! Does this mean the feds can get involved?? I don’t think I’ve ever even told her about the time I noticed my brother’s piggy bank was more full than mine, and convinced him it would be fun to dump them both in a pile and count it all by dividing it equally. So, so funny. We’re a bunch of not-so-nice first borns. I like us a lot. At least she is only selling it to her siblings. Mine do try that at times, but the worst was getting a call from my 7 yr old’s teacher that he was selling his silly bands for a dollar a piece to the other kids. He even spent the money right away. That was a fun one to explain and fix. Thanks again for sharing. I always love to see my thoughts in writing and knowing that I am not the only one. Hope you are feeling better. Hilarious, Julieann! I SO love it when other parents have kids who do stuff like this (and love even more that your son spent the $ right away… there’s a kid after my own heart). Thanks for sharing! I’m debating whether I should pull Abby aside for some quality Aunt/Niece time and run her through the finer points of holding garage sales for her siblings, too. I used to do it w/my sister– you lay out all your wares(read: crap you don’t want anymore), and invite in your VIP guests (read: younger sibling/s). It’s dealers choice on if you offer terms of set pricing OR if you are open to trades (goods or services) and/or bartering. Your new My Little Pony dream set for my half-used tube of neon lip gloss? Deal. My 3/4 used journal (recently extracted from the trash) for you doing my chores for a week? Done. No matter which way you go, a sibling garage sale is absolute GOLD! Oh my gosh, Kim… laughing SO hard. I’m not sure whether I should lock my children away for you or send them straight your way for lessons from a very clearly qualified big sister. I mostly resorted to browbeating my little brother… a little ridicule thrown in… occasionally let him get me a glass of water, if he was really, really lucky. You achieved a much higher level of subtly and manipulation… I’m very, very impressed. P.S. Sorry for all the typos!! 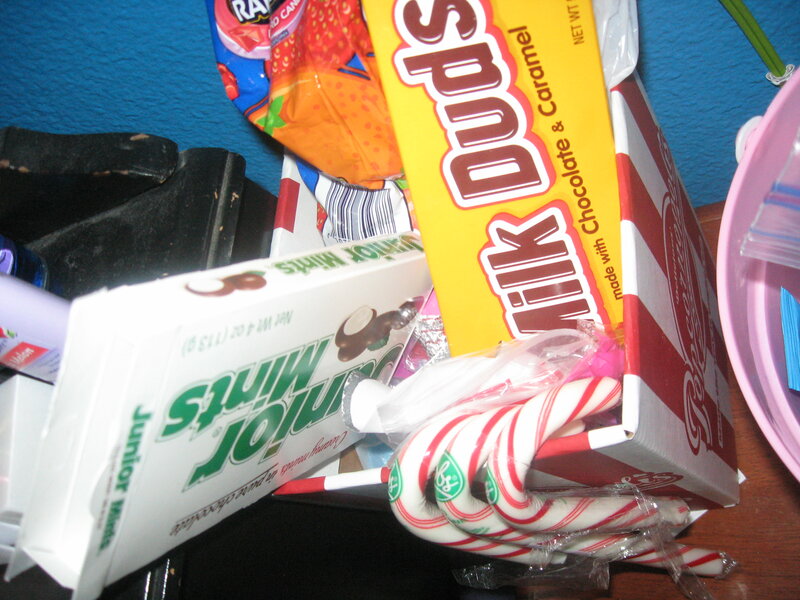 If i were you i’d be digging thriugh my purse right now to buysome of that candy! That’s every kids favorite big sister!